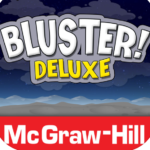 Bluster is an engaging word-matching game. This word matching game can be played in single-player and multi-player modes, users match rhyming words, prefixes and suffixes, synonyms, homophones, adjectives, and more. Entertaining and easy to use. The App contains 800 words. Can be played in single or multi-player mode and can be played collaboratively. In single player mode users can turn on Speak Words to hear the word lists and users in both modes can turn on Show Hints to highlight mismatched words. Users cannot add words to the built in dictionary.